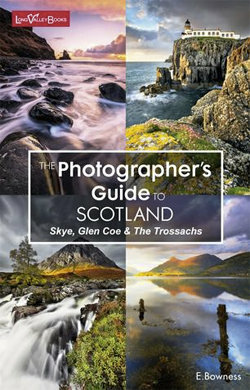 The Photographer's Guide To Scotland is the newest edition to Ellen Bowness' successful series, helping people to find the best photos in the UK's most photographed places. Previous offerings include guides to photographing the Lake District, Peak District and London. This edition covers Skye, Glen Coe and the Trossachs â€“ some of the most photogenic locations Scotland has to offer. As with all Ellen's books, this guide is extremely comprehensive including maps of the area and lovely images of each specific location listed. For each location there is detail on the area, how to get there, accessibility and grid references. There's also general helpful information, such as the best times of year to visit, the type of clothing you'll need and sunrise/sunset times. Scotland has a lot of hidden treasures that can be difficult to find unless you know where you're going so this guide will be invaluable to anyone wanting to explore Scotland to the fullest with their camera.